Apparently. 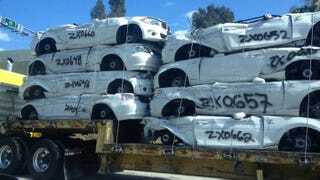 BMW didn't learn a lesson from GM: When destroying a fleet of electric cars, avoid parading their crushed carcasses on the back of a trailer for the world to see. It's just in bad taste, and former owners are reacting like it's a funeral procession with open caskets. The 1,100 BMW Active E test cars were just that: test cars. They were designed and deployed to give the electric drivetrain a proper vetting before being installed in the production i3. Some survived, with 80 examples landing in the DriveNow car-sharing fleet in San Francisco. Others were on this flatbed heading down Route 91 east of L.A., and no one – particularly the early adopters that signed up for the privilege – should be surprised. "This was always the plan," says BMW spokesman Dave Buchko. And it's the same fate that awaits nearly all pre-production test vehicles, including many of the cars we test on a regular basis. But that's apparently too much for some people. Take this quote from Pamela Thwaite, an Active E owner speaking with Transport Evolved. After 193 washes and endless care and attention, I'm too sad to say anymore. Yes, she counted the washes. Or Michael Thwaite, who said, "This is just insensitive, thoughtless and ultimately brand destructive," before pleading "Come on guys, throw a tarp over them at least." Now we love our cars. Some of us give them names and assign personalities and talk to them. But there's a fine line between enjoying a machine and falling into the emotional rabbit hole of anthropomorphized affection. It will never end well. To BMW's credit, they've removed the batteries – both from the Active Es and the Mini Es before them – and are putting them to work as second-use projects, including energy storage units attached to solar panels and battery back ups. Injecting more Active Es into rental fleets is only worthwhile if there's demand to support it, and Buchko says it isn't there. "Putting cars that [DriveNow] can't possibly use doesn't make sense," says Buchko. Could BMW have handled the fate of the Active E better? Maybe. But it's hard to attack its commitment to electric vehicles when BMW is only the second automaker to deliver a ground-up designed, mass-market EV – let alone investing over $1b into a dedicated brand to market it.